Incidents mainly occur due to blade failure, fire, structural failure, ice throw or in transport. Many risks can be directly identified, limited and perhaps eliminated in the design and construction phase. In negotiating with manufacturers of turbines and foundations, additional risks can be negotiated, mitigated or eliminated. The risks that remain in operation may be further limited through a description of methods, processes and clear instructions in your HSSE system. In these roundtable discussions, we will include owners HSSE experiences and also investigate if HSSE could be strengthening by a closer collaboration among owners. O2O WIND has been used as a communication hub for some bigger incidents but more detailed information directly from the right sources could improve transparency and HSSE. From time to time the wind industry “guarantees confidentiality” of incidents reported. No other energy industry works with such secrecy regarding incidents. The wind industry should be no different. What are the owner's incentives concerning health, safety, security and environment? How are various regulations and standards, such as OHSAS 18001, En50308, RenewableUK, GWO helping the owners to improve HSSE? Which major risks do we identify during design, construction and operational phases, and how do we categorize, prioritize and limit these risks? Experiences for how we develop, implement and maintain our HSSE systems in our wind power projects. How are our HSSE system structured and how do we design procedure manuals, processes and instructions? How do we design systems that will be effectively adapted to new projects? 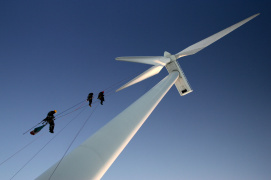 Examples around the table: practical risk assessment in our wind power projects. How can we better supply manufacturer of turbines and foundation and sub-suppliers so that our needs and challenges are fully understood? How should the HSSE responsibility be balanced between the owner, manufacturer of turbines and foundation and sub-suppliers – in the contract? What risks have in fact proven possible to limit in the negotiations with manufacturers of turbines and foundations? How can we act if the manufacturer of turbines and foundation does not accept our HSSE plan? Can we solve legal risks through insurances? How can we produce better communication plans for well-functioning HSSE work? Experiences around the table for how to design a training program to develop routines and attitudes at wind power projects? How good are we at having the operation and maintenance strategy and HSSE strategy to go hand-in-hand? Which are the major cost drivers to conduct effective HSSE work?